Ranges in length from 19 to 21 inches. They are a white feathered bird with a short, yellow bill and a medium-size length neck. Their legs and feet are a light orange color. Adult birds develop buff feathers on their heads, backs and breasts during breeding season. Found foraging for food in various habitats, terrestrial and aquatic such as ponds, cattle pasture, parks, farmland, lawns, sports fields, roadsides and dumps. Native to Africa and Asia but is now distributed among Africa, Asia, Australia, Europe, North America and South America. In the U.S., they can be found in every state except Indiana, New Hampshire, Washington, West Virginia and Wyoming. Spiders, moths, flies, crickets, frogs and grasshoppers. They are known to catch their food by following cattle and farm machinery and catching the insects that are stirred up. They eat frogs and fish when in aquatic habitats. 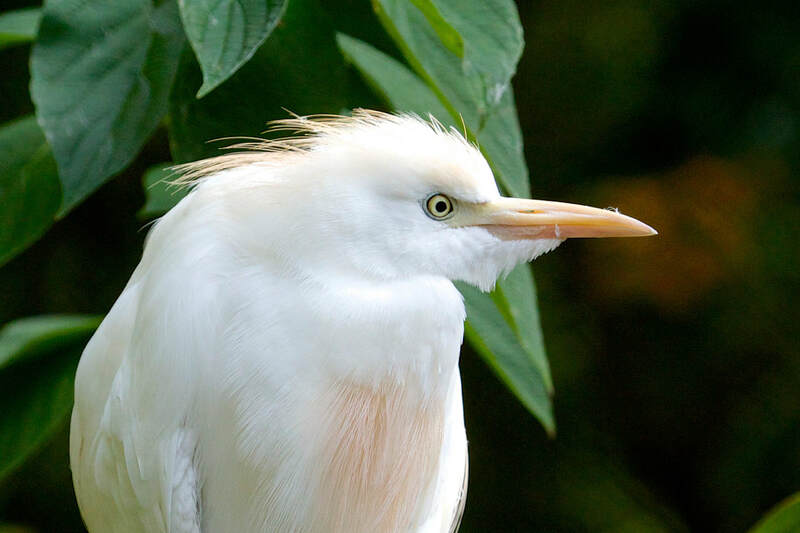 Captive egrets are given mealworms, smelt and crickets. Maximum lifespan is unknown but may reach 20 years. Sociable birds that live in colonies of several hundreds of birds living together. They are also known to nest with other types of birds. They follow cattle, feeding on the insects that are disturbed by the cattle. These birds are very adaptable to the new environments. Described as a “partially” migratory bird, migrating depends on the climate and the food availability in the area. 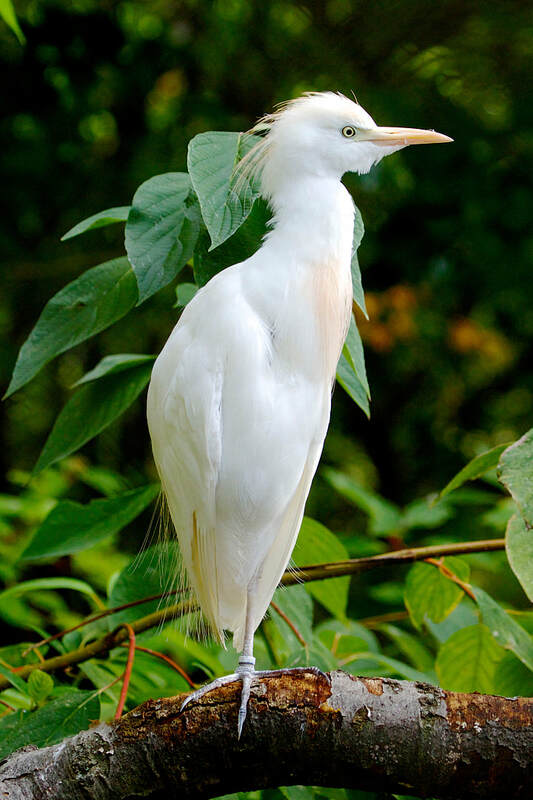 Cattle egrets are not endangered or threatened. I am moved to the Rainforest building during the colder months, but in the warmer months you can find me in the outdoor aviary across from the tiger exhibit. I am also known as the buff-backed heron.